I've had a terrible relationship with lace knitting. It has eluded me for years. I've admired the lace knitting of others and struggled to knit it myself. I tried a lace-knit-along last year and ended up with a finished object that looked like thread in the garbage can. 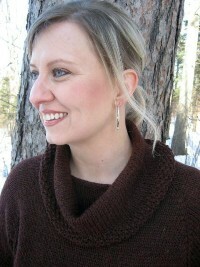 One day, last month, I decided I wanted to knit the Swallowtail Shawl from IK. After four froggings and sheer determination to be smarter than the lace, I ended up with this. I had a couple of things going for me. I read a lot of the Ravelry forums on this pattern because after four froggings, something wasn't right. One person had mentioned that the repeats seem to "borrow" a stitch from the previous repeat. With that information, I just memorized the pattern and went with it. I also used a sport weight yarn. (This is Nature Spun sportweight in cranberry fog). In my opinion, sportweight is a friendly yarn to begin doing lace patterns with. Lace blocking is magical though, and with a little luck, Icarus will look like it should. So, now, I am a lace addict. I find that the repeats can be meditative and relaxing, even a bit mind-numbing, if you prefer. About two years ago, I purchased a spinning kit with a drop spindle and thought it was the most stupid thing a person could possibly attempt. About a year ago, I thought I'd try a spin on my cousin's spinning wheel and ended up with a string of fluffy weirdness. Partly due to a tension problem but mostly due to user error. Lately, I've had some bravery or cockiness or a sudden rush of sh*t to the head and tried spinning with the drop spindle again. The first attempt is from two years ago and the second attempt is from this past week. I was motivated and inspired by reading about others who tried spinning with a spindle and just one day "got it". I'm not saying that I've got it by any means, but it does get easier and something definitely clicked. The spinning process is fascinating. I understand why people really enjoy it. I've even been wondering where I can find some roving locally. This is my swatch of the finished product. What? You no likey? Hee. This will be a reminder that it is about the process, and if I just keep trying, I might get better at it. Good for you for sticking to it! I heard the local knitting guild in Duluth has spinning on the 2nd Sat at the Depot if you want to get some help. I want to get there some day too.